Sportsbetting.ag is an all-in-one online gambling site that offers much more than sports betting. The website has a sleek design with an easy to use interface for accessing all the gambling options that they offer. With all the current odds, they have a sportsbook that covers a wide range of sports that you can bet on and also features sports news and its own set of promotions. Their services include a poker room, an online casino with hundreds of casino games that include a live dealer portal, a racebook and financial wagering. They are owned and operated by the same parent company as Betonline.ag so they are known to have the same reliable horse racing options from thoroughbred and harness racetracks all over the world. Sportsbetting.ag has become known for maintaining a professional relationship and ethical business practices with its customers from all over the world. What Types of Bonuses, Promotions and Incentives Are Available At SportsBetting.ag? Sportsbetting.ag has some of the best promotions in the industry. Exceeding the industry standard 50% promo, they offer a welcome bonus that will match 75% of your first deposit. They also offer a 25% deposit match lifetime guarantee for qualifying deposits. In the sportsbook, you have access to $25 in free live in-game betting if you meet the terms and conditions along with mobile betting and seasonal promotions that revolve in with the months. There are several promotions for all different types of betting on sportsbetting.ag whether its horse racing or slots and we encourage you to check them out for yourself. Is It Legal To Bet on MMA Fights at SportsBetting.ag? Yes, Sportsbetting.ag is owned by the same company as Betonline.ag and is one of the few providers in the world that offer their all-in-one online betting services to anyone in the world without restriction. Sportsbetting.ag is legally licensed and regulated through Panama City, Panama which makes it legal for them to operate internationally and welcome customers from countries that haven’t yet legalized domestic gambling. In the United States, The Professional and Amateur Sports Protection Act and the Federal Wire Act effectively make it illegal to own and operate a gambling business either online of offline in most of the US. There are not any US federal laws that make it illegal to be on MMA fights at licensed offshore sportsbooks that are operating legally within the industry. The only state that has specific laws prohibiting all online betting in their region is the state of Washington. Residenets in all other US states are not breaking the law by enjoying legally sanctioned offshore sports betting. With all the current and up-to-date betting lines on MMA, Sportsbetting.ag makes betting on a fight one of the easiest and most enjoyable things you can do with your evening. The betting odds for MMA are clearly marked under “martial arts” and then “MMA” as a sub category in the sports book. Once you’re there all the lines are displayed in front of you in an easy read and simple to use format. They have lines for each fight and fighter and display the over/under further down for the same line so you can hedge your bets. They offer a prop bet on the top for people who think the third fight between Conor McGregor and Nate Diaz will happen by Aug 26th 2017. As a huge fan of the sport of mixed martial arts, I find myself looking around to see if I can find anymore match ups on Sportsbetting.ag. They tend to only offer bets on certain fights, usually the main event and the co main event on a big enough card, but then on other cards they may have every fight listed or none at all. The MMA lines at Sportsbetting.ag seem to be a bit inconsistent and although very easy to use with favorable betting odds and streamlined over/under controls, you may not find the fight you’re looking to bet on if it’s on the undercard. We are hoping to see this brand expand their options in the future. Does SportsBetting.ag Offer Mobile MMA Betting Options? For SportsBetting.ag, convenience is the name of the game. Their browser is fully optimized for mobile sports betting and is compatible across most devices, operating systems and mobile networks. No download is required because the application is web based and can be accessed on your mobile device from the links included on this page. From your smartphone or tablet, you will be able to manage your account, make deposits and withdrawals, and place bets, including live, in-play bets. 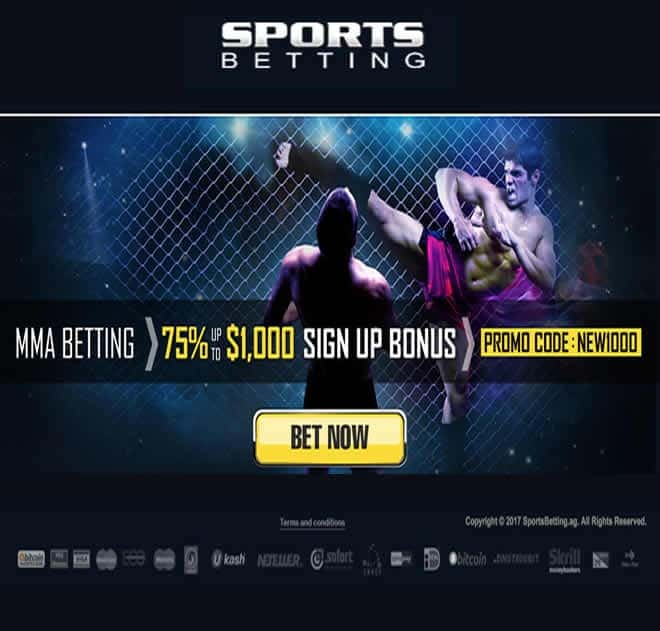 Is Live MMA Betting Available At SportsBetting.ag? Yup! As one of the first big links you’ll see on the homepage live-betting is something that Sportsbetting.ag prides themselves in. Their live betting menu includes an extensive list of sports events, games, matches and fights, including MMA / UFC fights. We recommend that you check their website at the time of the fight card to see if they offer this option for the MMA fight you are interested in betting on. Sportsbetting.ag has become a more prominent presence in the industry since 2012, when they were acquired by the BetOnline group. Launched in 1999, Sportsbetting.com had a rocky start. The sportsbook that had the .com behind it became known for having frequent payout issues and customer complaints. In 2012 when BetOnline acquired the domain, they paid out approximately 1.5 million dollars in back payout complaints and reestablished the name of Sportsbetting.ag as a reputable and trustworthy member of the online gambling community. This brand is now among the top rated sportsbooks in the industry, and consistently works hard to maintain that status. The banking suite at SportsBetting.ag offers a simple, streamlined process for accessing deposit and withdrawal methods. They accept all sorts of deposit options, including Cashier’s checks, money orders, book-to-book transfers, person-to-person money transfers from multiple providers, Bitcoin and all major credit cards. Bitcoin is by far, the easiest option to use. For your payouts, they also offer several approaches and there are some fees accompanying some of them. A check sent by courier seems to be the cheapest option at $35. Or, of course, you can have it sent to your eWallet through Bitcoin for free! You can also choose to have your winnings set to you by means of express check with a processing fee of $50. You can also select to have a Bank wire or a MoneyGram sent that comes at a fee that’s relative to the amount being sent. What Type of Security Is In Place At SportsBetting.ag? The security that is in place at Sportsbetting.ag is top-of the line. They employ technologically advanced fraud protection software to protect themselves and their customers from any potentially malicious attacks. They have a team of specialists on call around the clock monitoring their servers with are equipped with SSL data encryption, anti-virus software, and firewall protection. All of this security protocols are independently assessed by a third-party agency trained in detecting the weaknesses in systems like these. Sportsbetting.ag has come a long way from its ‘.com’ days. Since 2012 when the Betonline group picked them up they have been constantly improving and making changes to the internet gaming industry. They have become a trusted name in the industry and their rigorous licensing and regulatory oversight proves it. As an MMA fan, they are slightly lacking in match ups but they make up for it with premium betting services, strong customer support, user friendly banking suite and a nice range of wagering options available for their lines. The deposit and withdraw methods are so vast that you are sure to find a method that works and is convenient for you. They feature and easy-to-use interface that includes all the sports you could bet on, a racebook that tracks races from thoroughbred to harness from all around the world on a daily basis and an online casino with hundreds of games to choose from. They even have gambling on the financial sector to see how good you are predicting the stock market. Since 2012, Sportsbetting.ag has become the pinnacle of professionalism and reliability in the online gambling market.